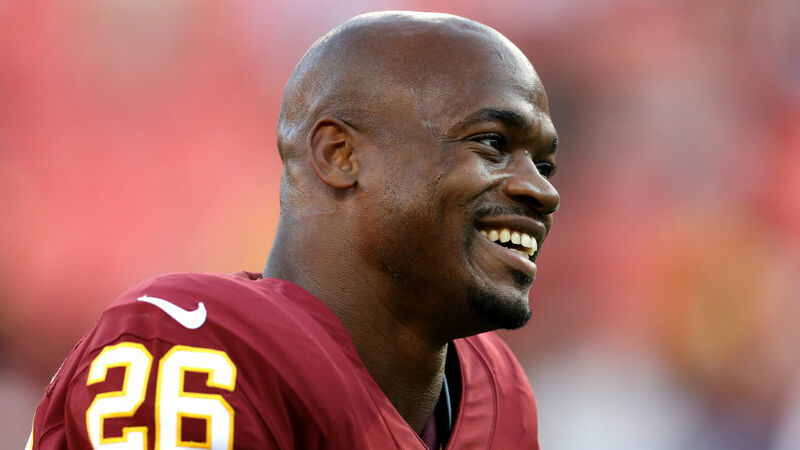 Could this be the resurgence of Adrian Peterson? We’ll find out Sunday when the seven-time Pro Bowl running back get his first start with Washington. Reports surfaced Wednesday saying Peterson would start just two weeks after signing a one-year, $1.015 million contract with the Redskins — his third one-year contract in just two seasons. “I feel like anyone who’s doing anything, you always have some doubters who give up on you, and it motivates you to keep pressing forward. So that’s been part of my motivation,” Peterson said, via ESPN. Peterson, who at one point wasn’t even guaranteed to make the roster, will be playing against the Cardinals — a team he started six games for last season. In Arizona, Peterson rushed for 448 yards on 129 carries. He also played in four games with New Orleans, with a total of 529 rushing yards and two touchdowns as well as 11 receptions and 70 receiving yards. The three-time NFL Rushing Champion will try to make up for an injured group of backs in Washington. The Redskins lost rookie Derrius Guice after he tore his ACL in the first quarter of their first preseason game. Samaje Perine and Byron Marshall both suffered sprained ankles in their second preseason game.